Inside: "All That Is Our Life" w/ Walter Clark; Spring Fling! 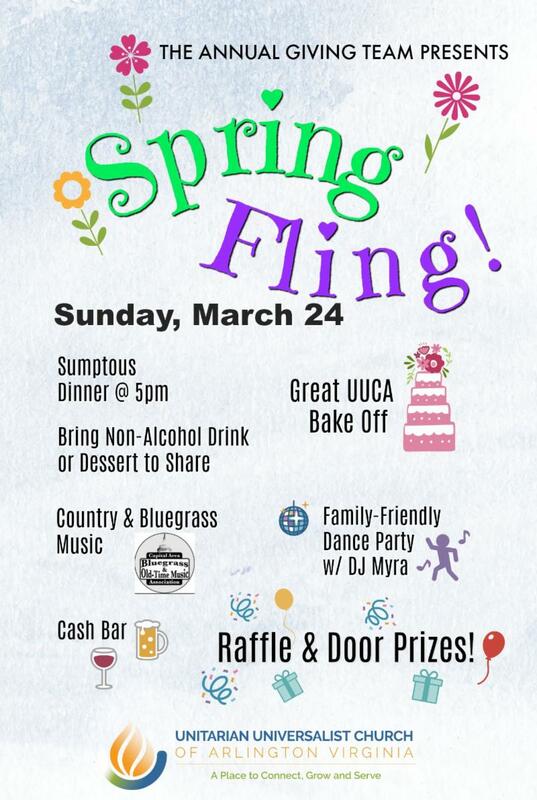 UUCA Great Bake-Off; plus much more! All the news you need to know to connect, grow, and serve. Sunday, March 24, 2019 | 9:15 and 11:15 a.m. 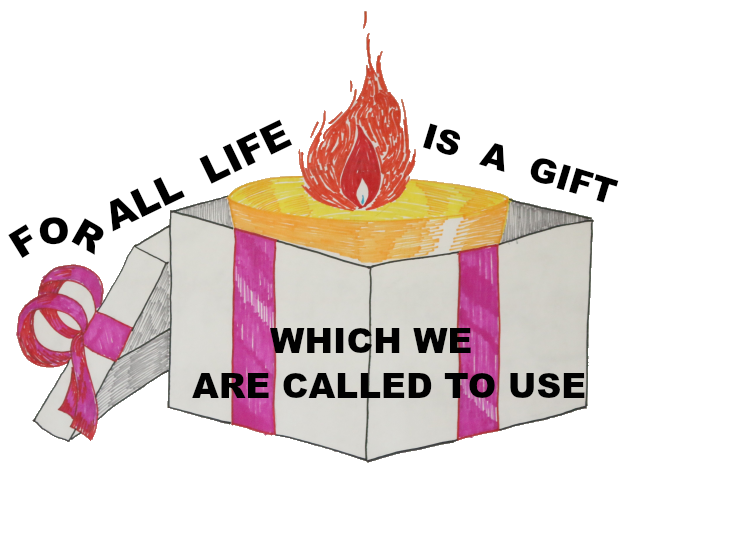 When we walk into the building each Sunday to worship, we bring our own unique gifts. Our time, our energy, our passions, and our pain. By sharing these gifts, not only do we make our community better, we make ourselves better in the process. Robert Blinn is our Worship Associate. Our music includes UUCA's Intergenerational Pop-Up Choir--All are invited to join the Pop-Up Choir this Sunday (see details below). The Chamber Choir will sing a madrigal piece by Thomas Morley, Sing We and Chant It and the hymn classic, Nearer My God to Thee , arranged by John Gardner. Music Ministries Associate Sophia Morreale will perform Mozart's Sonata in C on piano and Fugue in C by Buxtehude on organ. Special guest Mohammed Abdelilah , Moroccan American Community Association President, will bring greetings from our Muslim siblings who have Friday prayers here at UUCA. March 31, 9:15 and 11:15 a.m. Service led by Walter Clark and Sanctuaries DC. Inspired by the promise of beloved community, members of Sanctuaries lead us on a journey to "Where Harmony Lives.” Join us as we envision the beloved community we all long to see made a reality. "Self-Care Sunday" - April 7, 9:15 and 11:15 a.m. "In Sickness and in Health" - Sermon by Rev. Dr. Terasa Cooley. Wellness activities will follow each service. Palm Sunday, April 14, 9:15 and 11:15 a.m. Service led by Rev. Robert Blinn. Easter Sunday, April 21, 9:15 and 11:15 a.m. "The Promise of the Empty Tomb" - Sermon by Rev. Dr. Terasa Cooley. When parking on Sundays, we ask that you please leave our main lot for visitors and those with mobility issues. On Sunday mornings the Masons lot across the street on George Mason and the Arlington Hall Park lot are available for parking. Street parking is also available along George Mason and in the neighborhood behind the church. See map here. 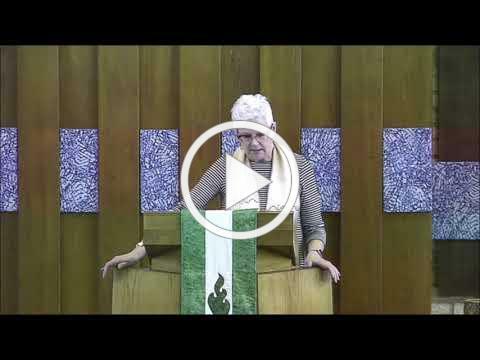 Click to your right to watch the recording of Rev. 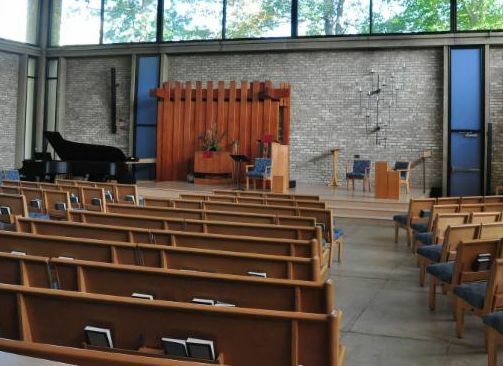 Terasa's March 17 sermon -- When Words Do Not Do Justice -- a sermon in response to yet another senseless and violent attack on a community of faith. The print version is available here. Not able to be with us in person on Sunday morning? It's now going to be easier than ever to join us online. 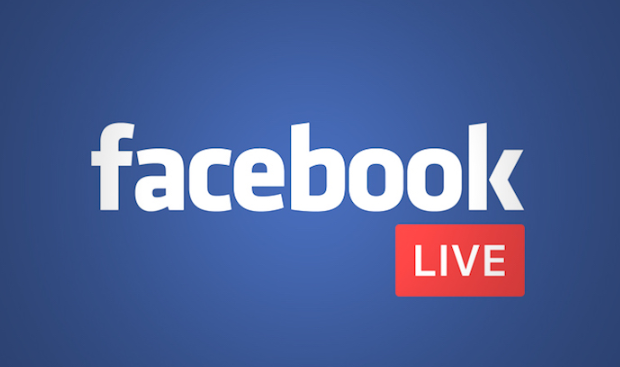 Besides joining in via www.uucava.org/livestream , you can now experience each Sunday morning via Facebook LIVE . 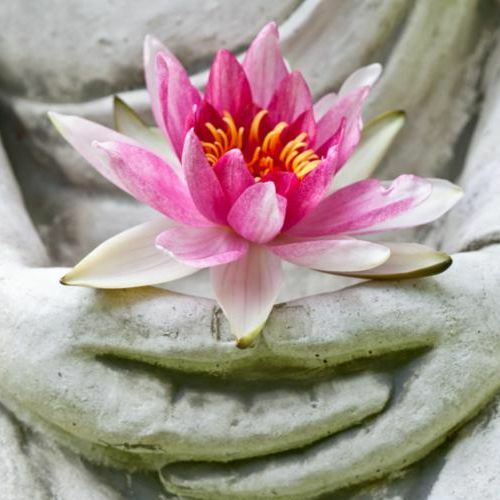 We invite you to smooth the path into the weekend with a half-hour of meditation followed by shared reflections each Friday morning beginning at 7 a.m. Please contact in advance either David McTaggart ( dmctagg@gmail.com ) or Gregg Forte ( gforte@mac.com ). A ride is available afterward to Ballston Metro. 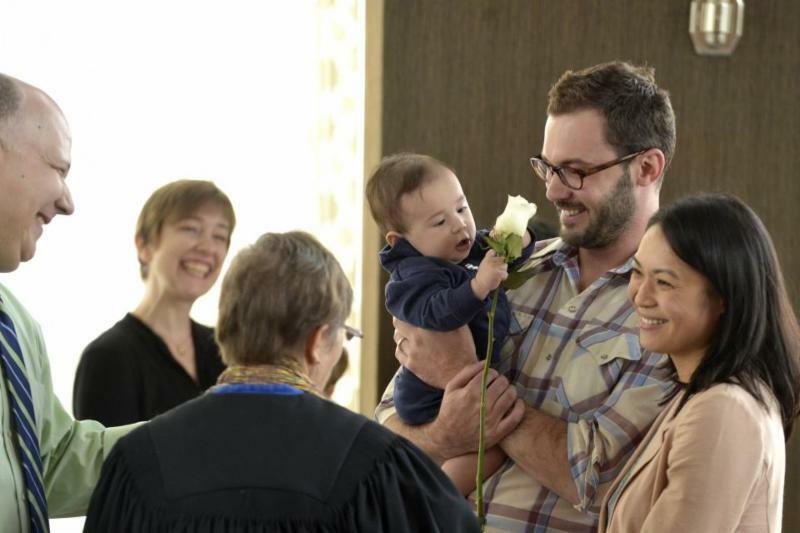 Sunday, March 31, 2019 – 12:30 p.m.
A special congregational meeting will be held to vote on the adoption of the 8th Principle. Absentee voting is also available. Members of 90 days or longer are eligible to vote. Childcare provided. An information session on the 8th Principle will be held in the Board Room following each service on Sunday, March 24. Please bring your questions. Visit the 8th Principle Facebook page here . 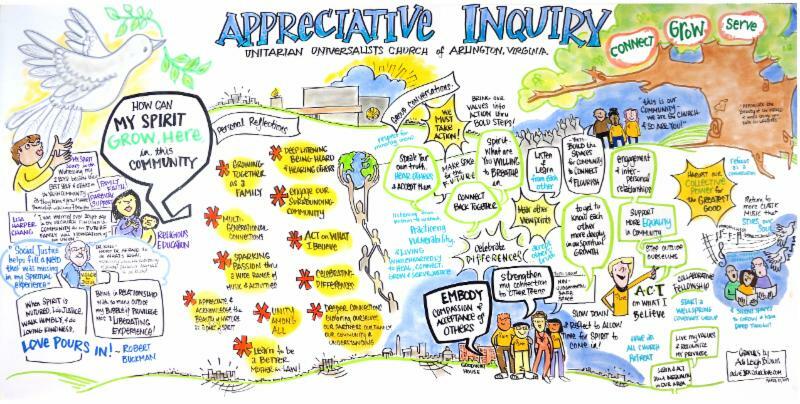 The above graphic depicts our Appreciative Inquiry into “How Can My Spirit Grow?” at our 11:15 service March 10. The ideas that we raise will help shape our transition to a new Senior Minister. This is a chance to further explore what you are thinking, in structured reflection and in conversation with others. Sign up here or at the Ministerial Search Committee table after services through March or by contacting Allen Keiswetter , keiswetter@aol.com . 5 p.m. A good old-fashioned Sunday roast beef and chicken supper with the Bake-Off prize-winning desserts (see below-still time to enter)! Bring your completed PLEDGE CARD if you haven’t already pledged to enter to win a DOOR PRIZE! DJ Myra in the Center until 9 p.m.; Bluegrass and Country music in Fellowship Hall until 8 p.m.
Can you help in the kitchen or with clean up? We’ll be in the kitchen prepping from 8 a.m. to 1 p.m. on Saturday. Contact Bruce Rieder, brieder@comcast.net, to volunteer. 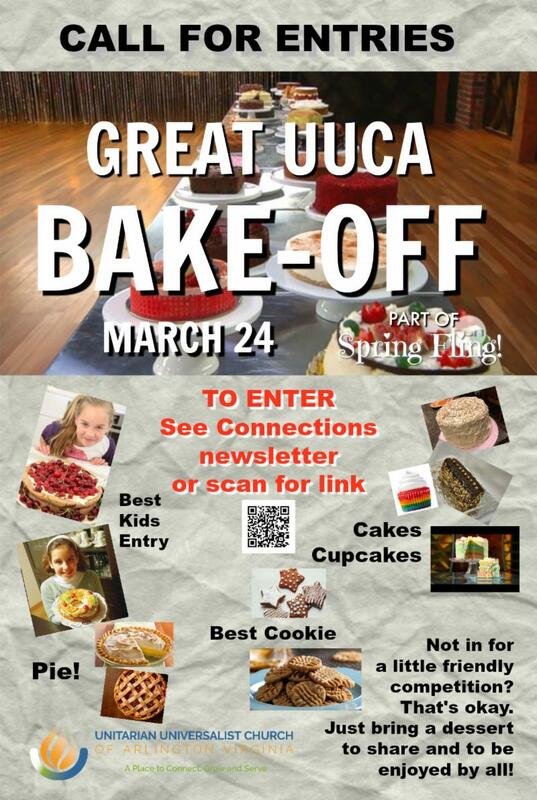 PLEASE REGISTER YOUR ENTRY IN ADVANCE HERE: The Great UUCA Bake-Off. More Bake-Off details here . Shaun Ryan is uniquely qualified to be a bake off judge given his current (unpaid) side job as his wife’s Chief Culinary Consultant. He is uniquely responsible for the taste testing of baked goods for her business The People's Republic of Sweets and provides her with an entire repertoire of perfectly suited adverbs and adjectives for the baking field. He has captured the sense of umami and has a delicate palate that can detect anomalies including attempts to reduce sugar and insert cardamom. Katie Musser is founder and Executive Chef of Green Sage Catering. Katie graduated with honors from L'Academie Du Cuisine. She has cooked at the acclaimed Vermillion Restaurant in Old Town and in a small French inn in southern France. Most notably, Katie has cooked here at UUCA! She is the top-choice caterer here at UUCA whenever a special event calls for fabulous food. 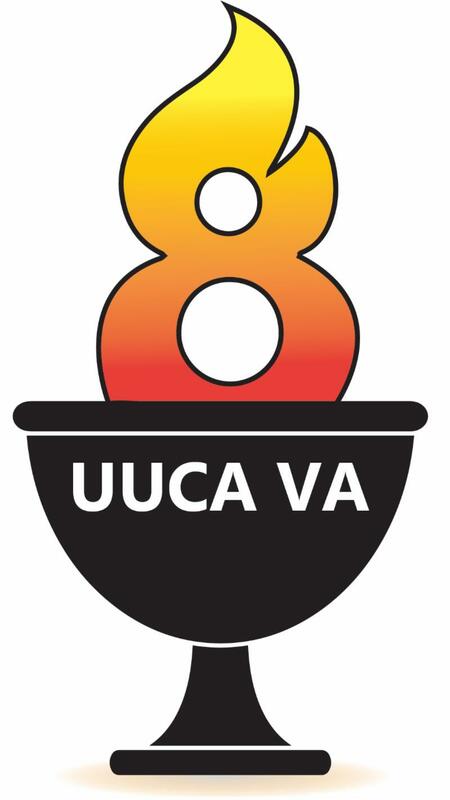 The UUCA Nominating Committee is in search of members to serve on the Board of Trustees as well as the Nominating Committee itself, all for two-year terms, starting in July 2019. If you are interested in learning more, nominating yourself or someone else, please stop by the Nominating Committee table after services on Sundays in March or contact the committee: UUCANomCom@gmail.com . Serving on the Board is a meaningful way to invest in something important, make an important contribution to the Congregation, and put your ideals into practice building our Beloved Community. You can find a UUCA Board Member Position Description here . The charge of the Nominating Committee is to nominate church members to serve in elected positions on the Board of Trustees, in other officer positions, and on special committees for presentation to the Congregation for election at the Annual Meeting in June. The Committee also works with the Board and the ministerial leadership to consider leadership development strategies for UUCA. Serving on the Committee is another meaningful way to serve, connect, and grow with UUCA, invest in our future, and help to build our community. For 2019 - 2021 terms we have four Board positions and two Nominating Committee positions to fill. We invite you to nominate yourself or someone else for the Board or Nominating Committee. The 2018-2019 members of the Nominating Committee are: Liz Fuchs (chair), Paula Bendl Smith, Nancy Hyde, Josh Mohr, James Tsai. Thank you to everyone who has submitted a pledge for our 2019-20 Annual Giving Campaign! 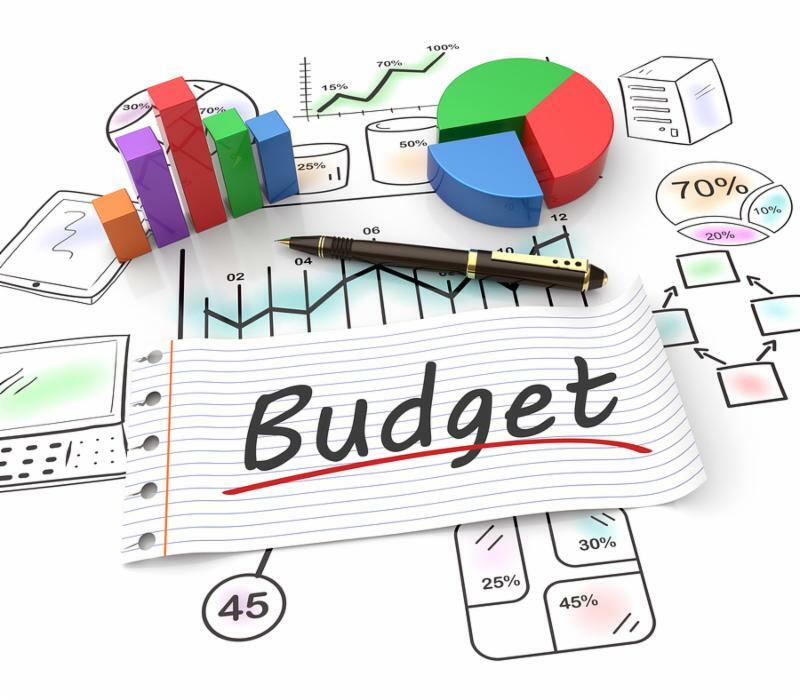 Two budget information sessions are scheduled for those interested in learning more about how the budget process comes together at UUCA and what our priorities would and could be. The content will be the same in both sessions, so just choose one that is most convenient. "Be the Change!" Thank You! Thank you to everyone who supported our children in the "Be the Change!" fundraiser. 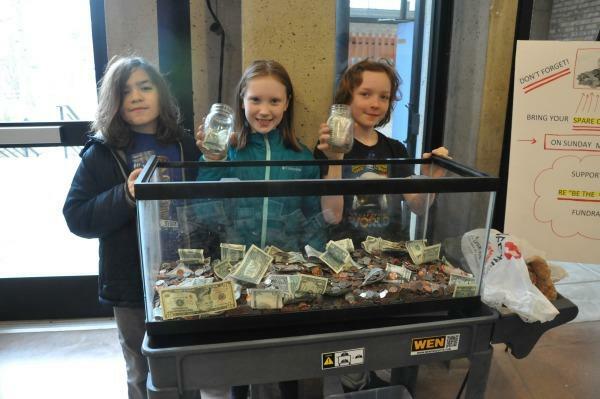 Thanks to your generous donations, the kids collected over $1,000 for our 2019-20 Annual Giving Campaign. Many of you have expressed sorrow and sympathy for the Islamic community in general and in particular for our Moroccan Muslim friends who worship in our building on Friday. We are pleased that Mohammed Abdelilah will greet us during the services this Sunday to express his appreciation for our friendship and offer a call to working together toward peace. You may show your support for the Moroccan community by being present during their prayers on Fridays. Their calls to prayer are at 11:30 a.m., 12:30 p.m. and 1:30 p.m. It would not be appropriate to attend their worship services but if you could greet people as they come in your presence would be very appreciated. There are a great number of people who attend these services so parking can be challenging. Walking, biking or carpooling and finding a spot on the street might be easiest. Thank you so much for your offers of love and support. New to UUCA or have a new member in your family? We are hosting a baby/new child dedication in the services on Mother’s Day. If you’d like to be included, please contact LeeAnn Williams, Director of Lifespan Religious Education, lwilliams@uucava.org. Below is a list of our upcoming Adult Education classes. Click here for more information and registration. 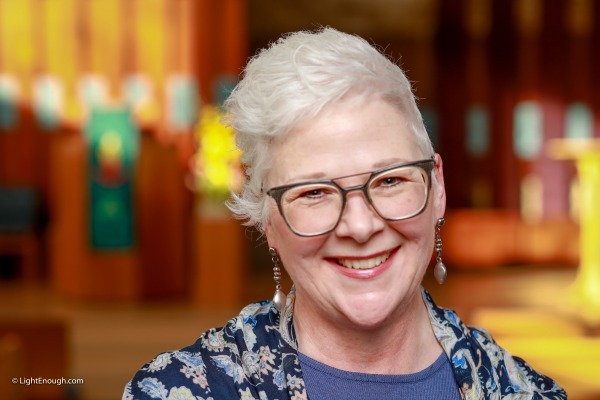 Reversing Global Warming, March 27, 7 p.m.
Building Your Own Theology, six sessions begin March 27, 7-8:30 p.m.
Enneagram Workshop, May 8, 15, 7-9 p.m.
Adaptive Leadership Workshop, May 5, 2-5 p.m.
Project Drawdown is a coalition of more than 200 researchers and other experts who have identified existing solutions for addressing global warming. Solutions that not only slows global warming, but actually reverses it by 2050. Flyer here. Date: Wednesday, March 27, 7-9 p.m. This workshop is designed to provide those new to UU the opportunity to reflect on their religious history. The series addresses these issues through a combination of dialog, and writing. The culmination of this course is the development of a personal credo statement. With LeeAnn Williams and David McTaggart. Dates: Six sessions March 27, April 3, 10, 17, 24, May 1, 7-8:30 p.m.
With Rev. Terasa. Adaptive Leadership is a method of understanding leadership developed by Ron Heifetz and colleagues of his at the Harvard Kennedy School. 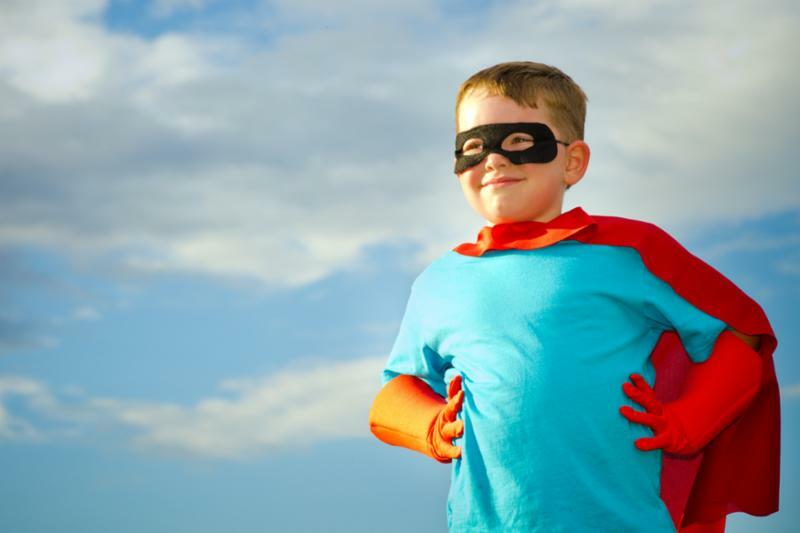 It posits that leadership is not a noun, as in ‘this person is always the leader’, but that leadership is a verb, it is what we exercise together. In this understanding, anyone can be a leader. Date: May 5, 2-5 p.m.
Back by popular demand! Join Rev. Terasa for a four-part series exploring the Enneagram. The Wisdom of the Enneagram: The Complete Guide to Psychological and Spiritual Growth for the Nine Personality Types by Don Richard Riso recommended but not required. Dates: Two sessions, May 8 and May 15, 7-9 p.m.
Come be a part of UUCA's Multigenerational Pop-Up Choir! Come one, Come all! Anyone who loves to sing! We will gather for one rehearsal between services this Sunday to prepare a song to be sung during second service. Who: Anyone, at any age - who loves to sing! For more information, contact Mimi Bornstein, Director of Music Ministries, MimiB@uucava.org. 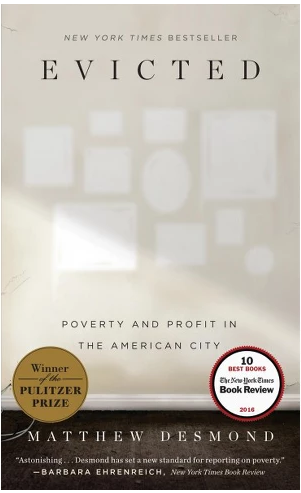 T he Men's Book Group will meet on April 14 to discuss the non-fiction selection Evicted: Poverty and Profit in the American City , by Matthew Desmond. 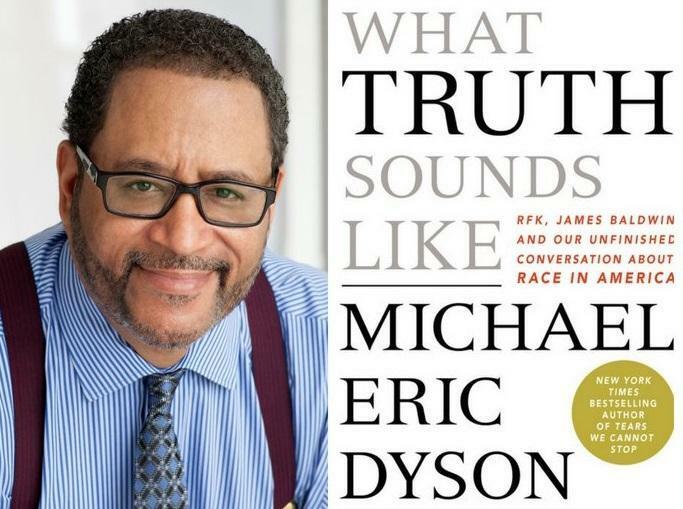 The book tells the wrenching story of eight families in Milwaukee struggling to keep a roof over their heads . It's available at local libraries and is in paperback. If there are any questions about the group and its meetings, please email Ken Marshall, kenmar42@gmail.com or call 703-533-8004. 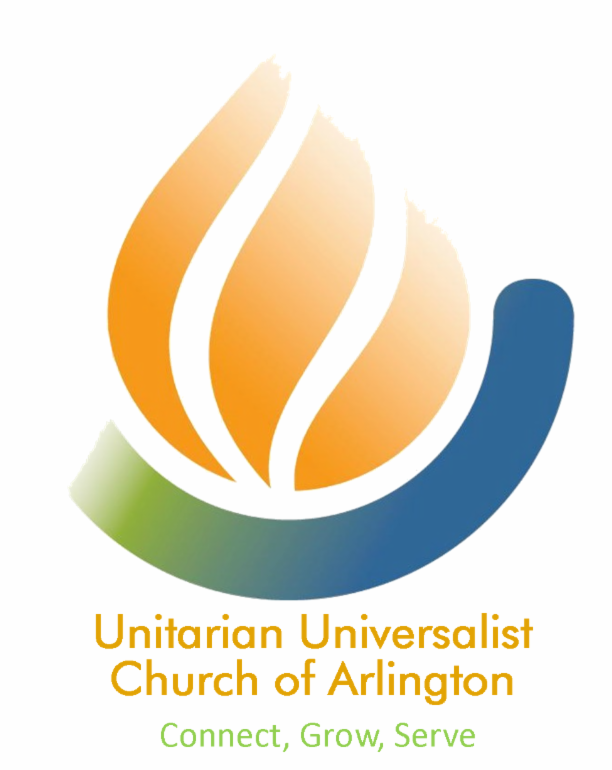 Date: Sunday, April 14, 7:30 p.m.
Arlington County Police Corporal Elizabeth Lennon and her team will present Safety in Houses of Worship at UUCA Sunday, April 28. All are invited to attend. Those who serve in leadership and/or volunteer roles at UUCA on Sunday mornings are especially encouraged to participate. Questions can be directed to Annie@uucava.org. Dates: Sunday, April 28, 12:30–2:00 p.m. Please join Walter Clark, UUCA Ministerial Assistant, and other social justice activists on the steps of the Supreme Court on March 26. 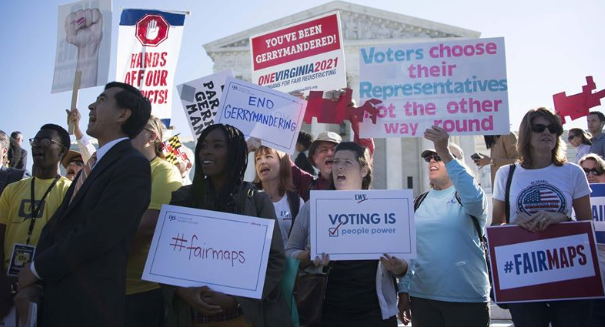 SCOTUS is scheduled to hear consolidated cases Common Cause v. Rucho and LWVNC v Rucho along with Maryland case, Benisek v. Lamone—potentially landmark cases that could set a nationwide precedent to end gerrymandering for good. Please let Walter know you are joining him by emailing WClark@uucava.org. For more information on the rally and its sponsors, visit Facebook here. ALIANZAS, a ministry within UUCA in support of Guatemalan indigenous people, as part of its work provides financial support for the work of two accompaniers, Meredith and Rosemary. During our recent trip, our UUCA delegation had the opportunity to meet with them to learn of their work as well as with Tal who will join our supported contingent of accompaniers. We are happy to report that UUCA’s investment is impactful to this important work which supports our UU 6th principle goal of world community with peace, liberty, and justice for all. 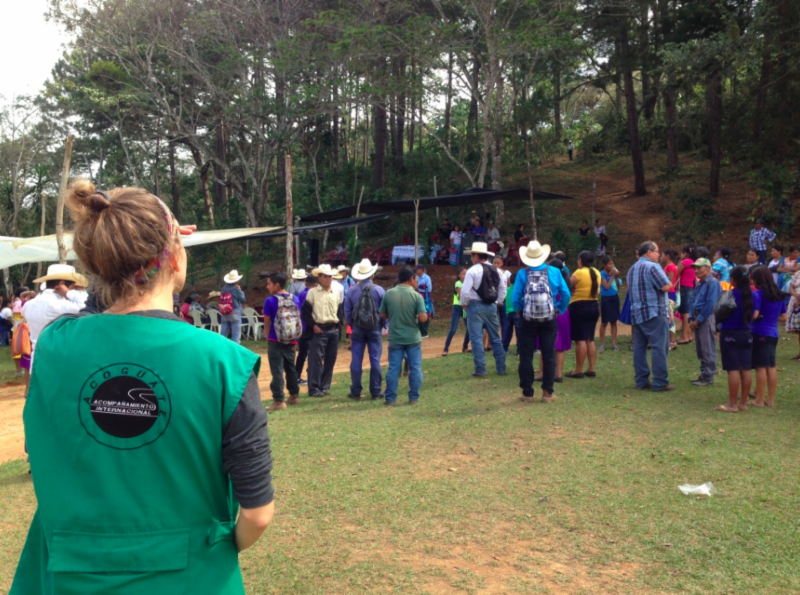 You can read more about what accompaniers do HERE and Meredith's reflections on her work here . Over the next few weeks our delegation will be reporting back on our rich and meaningful association with NISGUA and with ADIVIMA , another impactful partnership story. If you are concerned about racial justice, legal system reform, affordable housing, mental health access, or immigration rights, you'll be glad to know that at their annual meeting last week, VOICE leaders from most of the region's 50+ congregations clarified a very ambitious agenda for 2019. 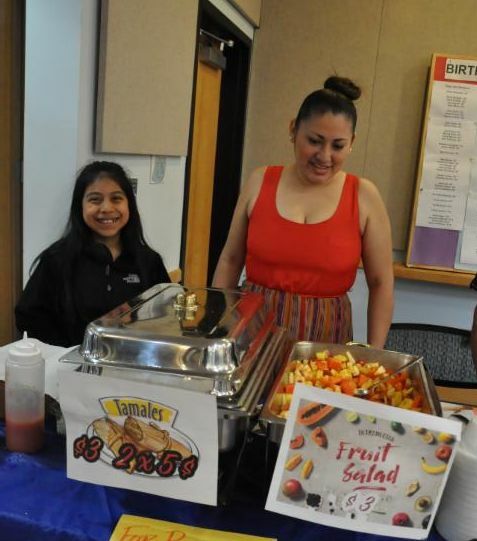 Cooks from the Buckingham community will be selling savory Latino fare after services on Sunday, March 24. No time to eat? They’ll provide carry out. Income from sales go to a charity which benefits immigrants. Peace Camp volunteers will be in Fellowship Hall after both services this Sunday to talk about the camp and answer your questions. Now is the time to register. 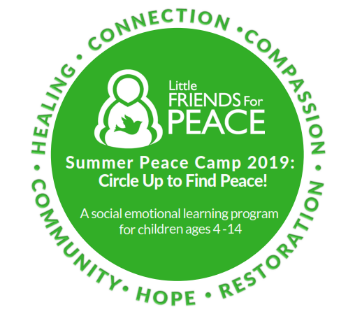 This year's theme “Circle Up to Find Peace” emphasizes the need for including others in our own personal journeys of peace. 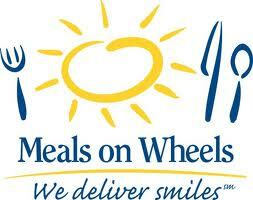 New Meals on Wheels Route for UUCA! UUCA delivers meals to MoW clients in South Arlington on the fourth Thursday and Friday of each month. Due to an increase in MoW clients, a new route was formed and UUCA has been assigned to cover it. We have a wonderful crew of dedicated volunteers and we need to add a few more. This is a great time for YOU to join the team. It's a direct and meaningful way to connect, grow, and serve! The time commitment is from 11 a.m. to about 1-1:30 p.m. The meals are delivered at the First Presbyterian Church of Arlington, 601 N. Vermont St. (corner of Carlin Springs Road). Then volunteers deliver the meals throughout Arlington. Please contact one of the coordinators with questions or to volunteer: Tina Hinh, tinahinh@gmail.com or Sara Anderson, rayandsara@aol.com. Date: Friday, March 15, 7:30 p.m.
Join us for this celebration of solidarity by diverse communities and cultures who share a common vision--providing college scholarships for Dreamer students. NEW newsletter deadline: Connections deadline for submissions is EACH Monday at noon with publication on Wednesday. See below on how to submit an announcement. Deadline is noon each Monday. Please put "Connections" or "newsletter" in the subject box. Send announcement (150 words or fewer) in body of email or Word doc attachment. Questions about Connections? Contact MaryAnn@uucava.org. Thank you for using this link when shopping Amazon. 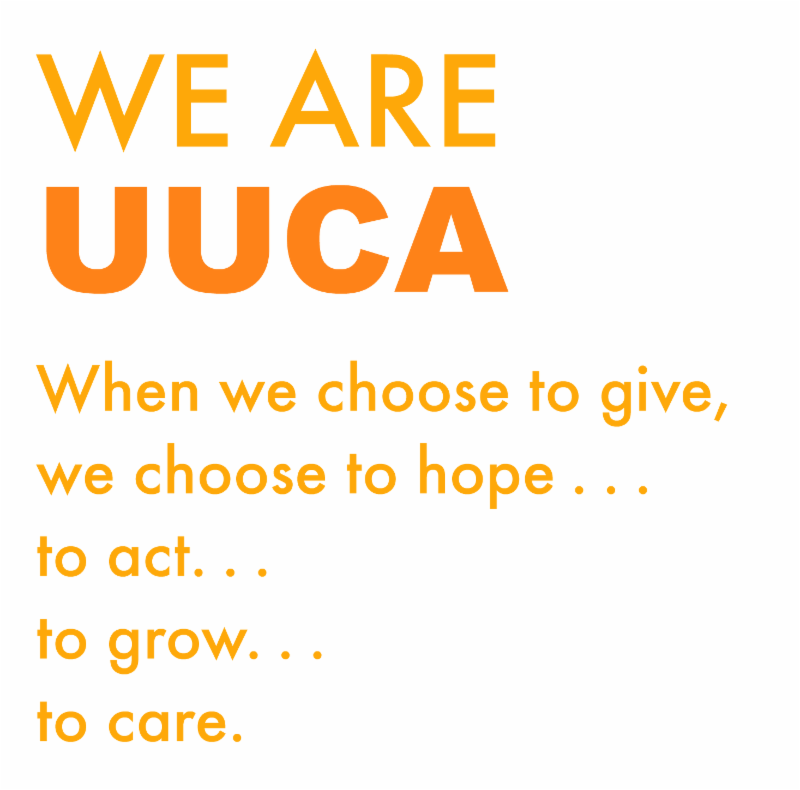 UUCA benefits each time you shop.